Were the roads closed to vehicles unlawfully during Manchester Pride 2018? 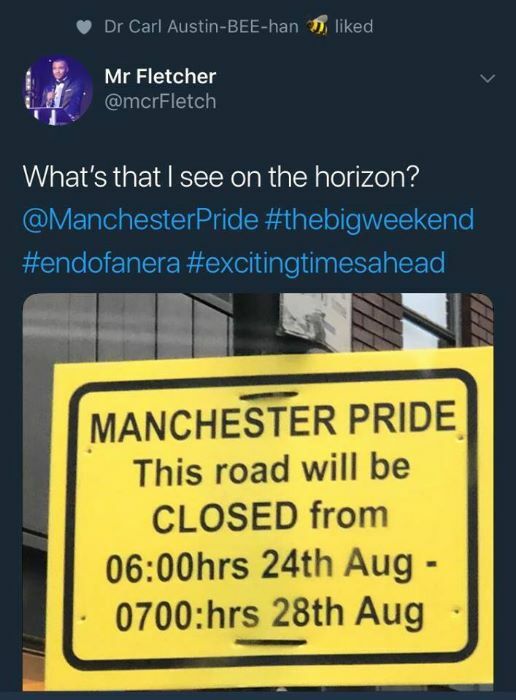 It seems that no traffic order was in place for some of the four-day Manchester Pride. We and others are in the process of finding out. 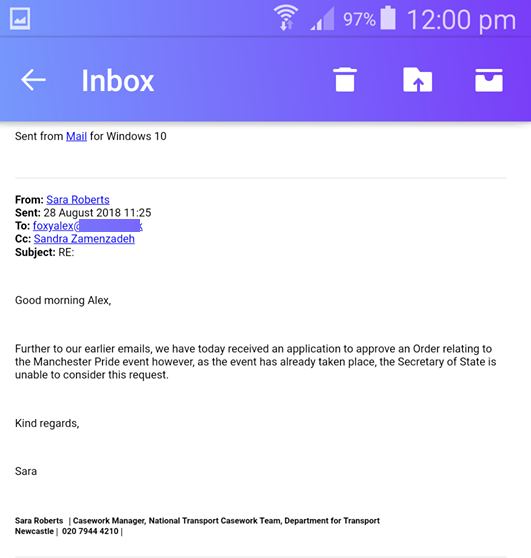 On the Tuesday after Manchester Pride finished, campaigner Alex received an email from the Department For Transport (DFT). It explained that the DFT had only just received a Traffic Order from Manchester City Council that morning. So the Secretary of State had been unable to approve anything for the Pride weekend. Because Pride lasts for longer than three days the Secretary of State must give approval for the road closures. But this year didn't. On Wednesday 22 August before the Pride weekend, by email, Geoff received a letter from the Deputy Chief Executive of Manchester City Council. It explained that the Council was still adjusting the Order (less than two days before the street closures were due to begin) and that he would receive a copy when finished. Finally on 13 September a copy of the Temporary Traffic Restriction Order (PDF) was received along with the City Council's approval of the making of it (PDF). "The Council made the TTRO by using powers conferred upon it under section 16A of the Road Traffic Regulation Act 1984 ("the Act"). This is the power used by the Council, in the last few years. By virtue of 16B of the Act, such an order can only be in force for three days. If any longer period is required, then the Secretary of State should agree to such longer period, before the order is made. Because every year the organisers of Manchester Pride require a 4-day closure of some of the highways, in order to enable them to clear litter and remove the equipment, the Council always obtains the Secretary of State's consent for the extended period of operation of the TTRO. "Unfortunately, this year the deadline to submit this application was missed and although the request for the Secretary of State's consent was submitted, it was too late. Nevertheless, this omission does not render the TTRO invalid or ineffective, at least for the first three days of its operation. "We will ensure that such an omission will never happen again in the future." "1. This Order shall come into operation on Friday 24th August 2018 and may be cited as the City of Manchester (Manchester Pride Event 2018) Temporary Traffic Regulation Order 2018. The Order will be operative until 24.00 hours on Monday 27th August 2018." Note that at the top the Order states it has been made "with the consent of the Secretary of State". This is untrue. For several years campaigners have had concerns that the Order was being left until the last minute, giving the public little or no time to see it before the road closures. Why was Manchester City Council still "adjusting" the Traffic Order on Wednesday when the roads were due to be closed on Friday? Considering the history of illegal obstruction of pedestrians, it's extraordinary that this was allowed to happen in 2018. 19 Oct 2018: this FOI request has received a response. There are many more questions. We'll bring you answers in due course. The ruling by the Local Government Ombudsman in April 2015 (PDF). The Ombudsman decided that Manchester City Council had exceeded its powers by mentioning wristbands in a traffic order and that it was unlawful to restrict access to premises (businesses and homes). Minutes of a meeting at Marketing Manchester in November 2002 (PDF). These show that those present were told they couldn't charge people to enter public streets. However they went ahead and did so from 2003 onwards for a decade. It was unlawful all along and they knew it. This document was unearthed at the Library Archives quite recently by a FactsMCR campaigner. Our factsheet for 2018 (PDF). As well as information about your right to walk on the streets, read about the increase in earnings for Manchester Pride staff in 2017! And why is no donation from the Pride fund shown in the accounts of George House Trust for the years 2012, 2013 and 2014? They are supposed to receive 25% of it. GHT didn't reply when contacted and asked about this. The factsheet for the previous year, 2017, is here (PDF). Since the ruling by the Local Government Ombudsman in 2015 the media — both LGBT and mainstream — have stayed silent about the decade-long wristband scam and about your rights. So some people continue to pay unnecessarily. All your favourites know: GayStarNews, Pink News, Manchester Evening News, The Guardian, BBC and many more. Believe it or not, in a letter, the BBC has actually defended its right not to report this! Yes, the same BBC which used to speak up about scams and the rights of consumers. These organisations don't need to lie. They simply ignore an issue completely. Or, they report some of the facts; perhaps popping in just one or two bits they don't like to add a fake impression of balance. That's how they manipulate opinion in the direction they think it should go. The veteran ITV reporter John Pilger has said that "not reporting" is the most powerful form of censorship. What else aren't they telling us?